The Yonex ASTROX 88 Skill (AX88S) Emerald Green badminton racket is designed to redefined the design of badminton racket for doubles player. The ASTROX 88 Skill (AX88S) Emerald Green is targeted for finesse players that control the net and position the shuttles to set up an attack, usually the players on the front court. Designed with the whole frame flexible allows the ASTROX 88 Skill (AX88S) to hold the shuttlecock for accurate control. In addition, the overall length of the Astrox 88S is only 5mm longer (5mm shorter than Astrox 88D Dominate), which enhances both accuracy and power. 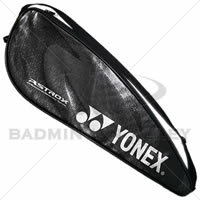 Astrox rackets are an attack-oriented model which can take the lead in a high-speed game with a design that can deliver powerful, steep smashes, allowing players to dominate the court. The new ASTROX 88 racket is equipped with Rotational Generator System. The counter balanced head adapts to each shot, helping you to control the drive and to attack the opposition with increased acceleration, steeper angle and power on the smash. 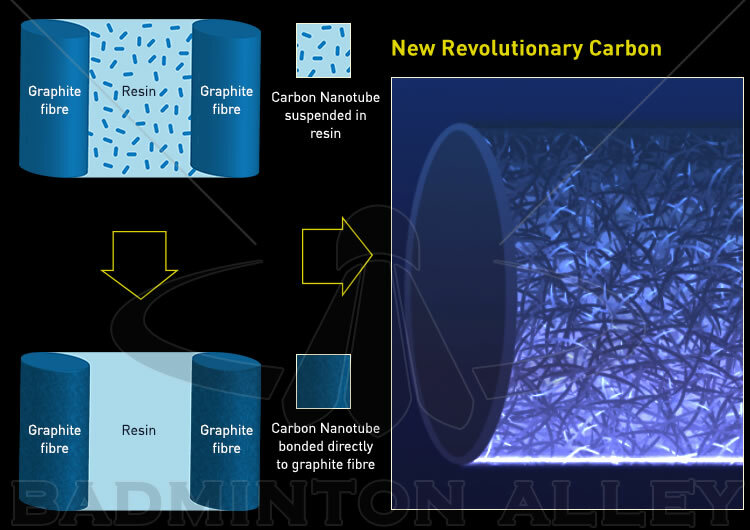 ASTROX 88 uses a world's-first, new dimension graphite material, Namd, which greatly improves the adhesion of the graphite fibres and resin by attaching nanomaterial directly to the graphite fibre. 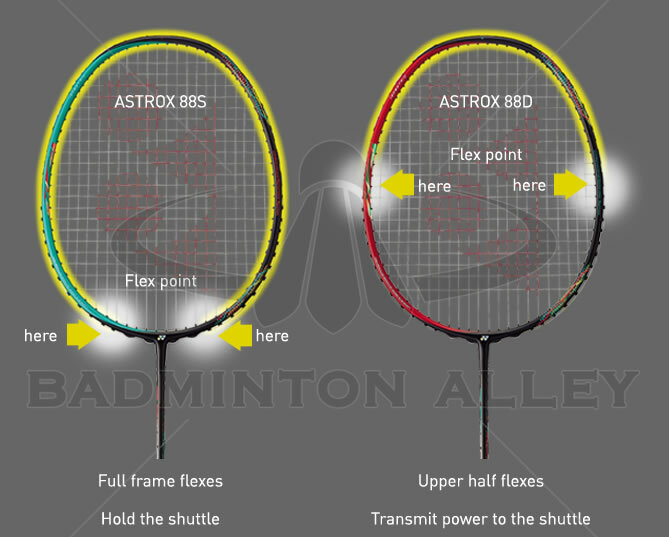 The new carbon material combination used in the primary composition creates a different Flex Point in each racket: Astrox 88S Skill will flex on the bottom of the head frame to hold the shuttle and give better control while Astrox 88D Dominate will flex at the center of the head frame to transmit power to the shuttle as shown on the image below. The Astrox 77 is known as one of the best in the world, and now Yonex has come out with a strong one-two punch in the Astrox 88 series. I play doubles competitively in defence and offence. This racket allows me to have the smash power and control I need, while also being manuvaerable to get the tricky cross net shots. I can't really feel a difference with the Rotational Generator System (perhaps my smashes need some more force), but this racket is still be great without it. I play with BGAB strings at 28 lbs tension which really add to my performance, but I can't really say for other strings/tensions. All-in-all, this racket is great for a balanced doubles player(and I find myself using for singles more than the ZF2).